How to Select the Best Manual Log Splitter? Knowing which is the best manual log splitter for the money all comes down to personal preference. How much effort do you want to put into splitting the logs, and how much do you want to leave to the machine? Because there are so many different brands, makes and models of log splitter on the market, the choice is entirely up to you. Within this buying guide, we aim to make the process that little bit easier. We can show you several different options from various manufacturers that you can buy online. Many of these will suit the varying requirements of homeowners and are generally top rated on the market. By reviewing each product carefully, you are sure to find one that ticks all the boxes to enable you to split logs with relative ease. Work type is probably one of the most important factors when it comes to choosing the best manual log splitter for the money. It’s all too easy to assume any log splitter will split any log, but that’s not true. You will need to pay careful attention to the log pile you have, measuring the largest log within it. Using these measurements, you can then accurately determine whether any particular piece of hand powered splitting equipment can complete the task. Then there’s the all-important labor factor. If you have particularly large logs needing to be split, a manual wood splitter might not be the best option for you. That is, unless, it features hydraulic components to make the process a little easier. Even without an engine, hand powered splitting equipment can be dangerous. Even though you have more control, any hydraulic components can work a lot faster than you may have anticipated. This may result in bark flying off the log and injuring someone, or it dropping onto your feet. That’s why it’s important that you wear safety equipment. This could include safety glasses, a hard hat, gloves and steel-toe boots. Remember, any kind of outdoor equipment is bound to feature sharp or unsafe components. Never become complacent around any machinery. Even the most top rated or highest priced log splitter is going to run into efficiency issues. While sometimes it’s caused by the machine itself, most of the time it’s caused by the operator. It doesn’t matter whether your manual log splitter is a foot operated log splitting tool, vertical or horizontal, you are sure to run into efficiency issues if it’s not used correctly. In order to make your log splitter operate as efficiently as possible, you need to make sure you’re operating it within its means. Pay careful attention to the log capacity and ensure all logs are safely within this range. Features vary depending on which kind of manual wood splitter you opt for. Many pieces of hand powered splitting equipment come with a horizontal or vertical option. Some also feature hydraulic cylinders, whilst others require you to use your arm muscles a little more than normal. You simply place the wood within the splitter and use the handle to push the wedge forward. In some cases, you push the wood down onto the wedge with a hammer, or use arm power with an axe. Unlike powered log splitters, there’s very little maintenance required for these manual wood splitters. You may need to check the wedge from time to time, but other than that, you simply wipe it down and store it away for next time. Manual wood splitting machines are a good option for those on a budget, and with minimal wood to split. There’s no point splashing out on wood splitters which cost a lot of money when they receive minimal use. In saying that, you still need to make comparisons between the price and the features. The more expensive option might not be the better option, and the most affordable might end up being a front runner. It can spit wood as large as some electric and gas powered log splitters. Wood is split with your foot to save your arm muscles. It folds flat for easy storage. It’s not suitable for very hard wood. It’s not suitable for professionals, only occasional splitting jobs. Renegade foot operated log splitting tool. QWhat is the maximum log capacity? QWhat is it suitable for? AOccasional use and for camping. QWhat kind of wood is it suitable for? Although this machine is designed for logs of 18 x 10 inches in size, many users note this can often not be the case. 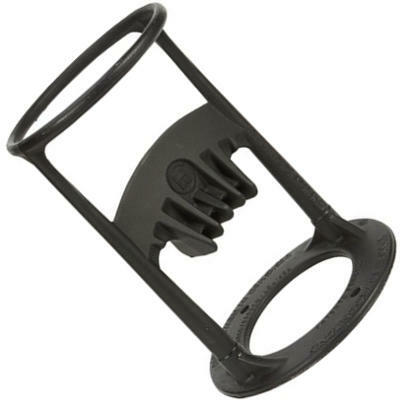 Customers who reviewed the product stated that many components bent after use, and it was not suitable for hardwood, or large pieces of wood, even within the recommended dimensions. It may be a good option for when you’re out camping, but it’s not a good option for homeowners. It’s certainly not one of the best manual log splitters for the money. Check out what other people who purchased this product think about it. Read Renegade LSF-001 manual log splitter reviews. For it’s size, it’s relatively powerful. It comes with a lifetime warranty. It’s easy to assemble and store away. It has a force of 14 tons. It has to have a log underneath it to work. It requires a bit more preparation and setup time than most other log splitters on the market. 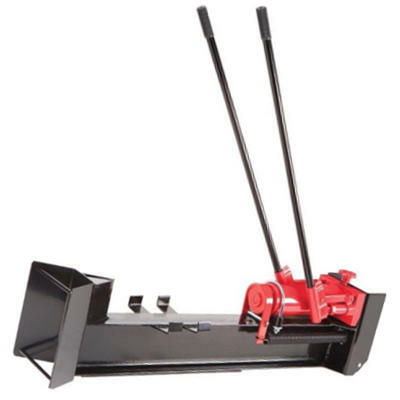 It costs quite a lot of money to own, in comparison to several other manual log splitters for sale. Dimensions: 2.36 x 5.51 x 47.24 inches. QWhat kind of log needs to sit underneath it? AA hardwood stump that’s a maximum of 14 inches high and is at least 14 to 15 inches in diameter. QHow is it set up? ADrill a hole in the log base to insert the splitter into. Secure it with a bolt. QWhat kind of wood can be split with this splitter? It may look small, but this Woodeze wood splitter really packs a punch. It has 14 tons of pushing power, can split regular and knotty logs, and doesn’t put pressure on any part of your body. It’s also very lightweight and easy to store. However, it does require a bit of setup. You need to have a log underneath the base which needs to have the splitter installed into it. This can prove time consuming for people who just want to split wood quickly. All in all, it does represent good buying and is top rated on the market when you choose to buy online. Check out what other people who purchased this product think about it. Read Woodeze 5MH-S-SPLITTER manual log splitter reviews. It’s relatively powerful for all kinds of wood. It has wheels for easier transport. It can split logs of up to 18 inches in size. It comes with a 3 year warranty – a lot more than some gas powered splitters. YTL International manual log splitter. Dimensions: 44.4 x 10.2 x 11.8 inches. QWhat is its log capacity? QWhat is the ram stroke? AYes, it has two levers to make it easy for anyone to operate. Even though it’s not the cheapest manual log splitter on the market, it offers several conveniences that other manufacturers don’t. It has handles for better grip, wheels for easier transportability and it even has two handles for ease of handling. Aside from that, it offers 10 tons of force and can split wood up to 18 inches in size. It’s not the best manual log splitter for the money, but it’s fairly close. Check out what other people who purchased this product think about it. Read YTL International 23101 manual log splitter reviews. It’s safe to use as your hands don’t come into contact with moving blades. It takes less force to split wood than a standard axe. It’s made of high quality cast iron. It comes with a five year warranty. It’s only suitable for creating kindling from small pieces of wood. It has a narrow base which limits the wood size. For its size and what it is, it’s quite expensive. Dimensions: 13 x 9.2 x 9.1 inches. Splitting Force: A 3 pound hammer’s force. Splitting Wedge: Top grade cast iron splitting head. QDoes the splitting wedge need to be sharpened? QWhat log size does it fit? QWhat kind of tool is best used to hit the wood through the splitter? The Kindling Cracker is an innovative product created to make splitting firewood far safer. Because your fingers aren’t used in any part of the splitting process, the risk of losing fingers is almost completely removed. However, for all the positives for this product, there are just as many negatives. It can only split firewood up to 6 inches in size. This means that you will have to use one product to cut the logs, another to get them to a reasonable size, and this product to create kindling. For its size and features, it’s also quite expensive. Check out what other people who purchased this product think about it. Read Kindling Cracker manual log splitter reviews. It can be used for medium and large logs. It produces several one strike splits. It’s well balanced to make it easier to handle. The handle and blade won’t break. It’s only for suitable tall users. It requires sharpening quite often. 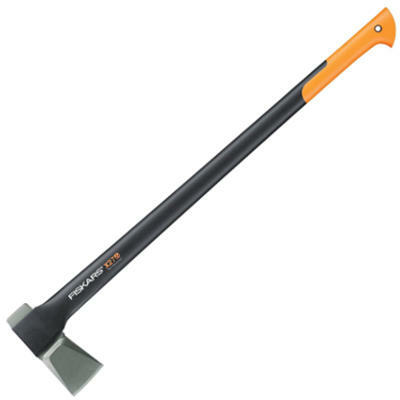 Fiskars manual wood splitting axe. Splitting Wedge: 36 inch forged steel blade. QWhat is the blade size? QWhat kind of wood can it cut through? QWhere is this axe made? QHow heavy is the axe head? Although a lot of manual labor is required, this axe lives up to its name as a heavy duty and reliable product. It’s easy to use, lightweight, and is easy to achieve one split strikes with. It’s also incredibly well priced on the market and has a lifetime warranty. Although it’s labor-intensive, it’s a very effective product. For this reason it’s one of the best manual log splitters for the money. Check out what other people who purchased this product think about it. Read Fiskars X27 manual log splitter reviews. Where to Buy Manual Log Splitters? We live in a very digital age, where the most obscure products can be purchased online. Manual log splitters are no different. If you’re looking for the best deal, you are sure to get it on leading websites such as Amazon. It’s here you can also read customer reviews and get a real understanding of the product you are looking to purchase. Of course, manual log splitters can also be purchased in more conventional ways, such as visiting a physical store.